Background: Wound healing process includes complex phases. Many studies have highlighted the importance of sterile wound washing in the healing process. Non-sterile wound cleansing could delay its healing and result in heavy costs for the health system. Objectives: The purpose of this study was to assess the efficacy and applicability of a new designed device, Safe Irrigator Syringe, in wound washing. Materials and Methods: This interventional study was conducted in the Infectious Disease Ward of the Imam Khomeini General Hospital. Twenty patients with wounds needing sterile washing and 10 medical interns enrolled in the study. Each intern performed wound washing for two patients using Safe Irrigator Syringe. After performing wound irrigation, an interview was performed to assess the applicability and efficacy of the new device and method. Results: All of the interns stated that the new device is quite applicable for wound washing and is easy to handle. Nine interns believed that Safe Irrigator Syringe is superior to the conventional devices regarding efficacy and performer’s satisfaction, while one intern believed that it is similar to the conventional methods. Conclusions: The designed Safe Irrigator Syringe seems to be applicable in wound irrigation and superior to the conventional devices regarding efficacy and user comfort. Wound healing includes several consecutive and complex phases (1). Many studies validate the positive role of sterile wound washing in its healing process (2). Non-sterile techniques for wound cleansing can cause delay in healing process and result in heavy costs for health systems (3). As mentioned in the previous studies, wound infection costs heavily in many countries (3-5). For instance, in the United States of America, 290485 cases of wound infections occur annually and each of them costs $ 25546 on average for the health system (4). The estimated investment for wound infectious management was reported to be over $ 7 million annually in the United States and unfortunately about 13000 patients die due to wound infection (4). It seems that sterile and pressurized washing of wounds can shorten the healing time (6). Usually, a fluid is used to remove exudates, debris, foreign body, and necrotic tissue. This procedure is necessary for wound healing (7). Different types of wound cleansing methods and agents were introduced recently to provide more effective ways for wound washing (2). Furthermore, pressurized wound irrigation have better outcomes in comparison with swabbing methods (6). Lack of a cost-effective and user-friendly device for wound irrigation is noteworthy in our country, Iran. Health care providers in Iran use sterile packs, including a sterile receiver and a number of surgical devices, which may not be necessary for sterile wound washing. The purpose fluid for wound washing should be poured in the receiver and the performer wearing sterile gloves uses a sterile gavage syringe and the fluid to irrigate the wound. The receiver has limited capacity and should be refilled several times. As the performer's hands have to remain sterile, another person whose hands are not sterile is needed for refilling the receiver. So, two healthcare providers should simultaneously take part in wound irrigation. Another problem with this technique is extra devices in the sterile pack, which serve no purpose in wound washing process. The repacking and re-sterilization of these extra devices are costly and time consuming. Also, the lack of isolated system, which delivers sterile fluid directly from the container to the wound could increase the risk of unsterile condition (1). As mentioned earlier, unsterile wound irrigation could increase the risk of infection and wound healing impairment (1, 6). To our knowledge, there is no specific instrument for wound irrigation, which could directly deliver washing liquid (e.g. normal saline) from the container to the wound. We designed a syringe to perform single handedly sterile washing process, which let the performer to explore the wound by the other hand. Furthermore, we believe that by using this device, wound irrigation could be performed by only one medical staff. This device could possibly be a replacement for extra devices used together for sterile wound washing. This study was designed to assess the advantages of this device in comparison with old washing methods, which are now routinely used in our hospitals. Opinions of health care providers about applicability and easement of using the device was evaluated as the goal of this study. This pilot study was conducted by 10 interns in Infectious Ward of Imam Khomeini General Hospital, Tehran, Iran. They were asked to irrigate at least two different wounds with the new device and their satisfaction was evaluated through interview. All interns had experiences of wound irrigation using old methods before their participation in this study. Totally, 20 patients suffering from wounds needing sterile washing participated in our research. Study details and the new device and method were completely explained to both interns and patients before receiving informed consents. Before performing wound washing by the interns, working with the device was explained to them. Health care providers for performing wound irrigations selected from interns of both sexes. They had to pass at least 6 months of their internship periods to be familiar with the routine wound cleansing methods with better judgment and perception. Interns with no background of wound irrigation or having less than 6 months elapsed of their internship periods were excluded as well. Safe Irrigator Syringe was produced after finishing legal registration of the invented patent at State Organization for Registration of Deeds and Properties of Islamic Republic of Iran (8). 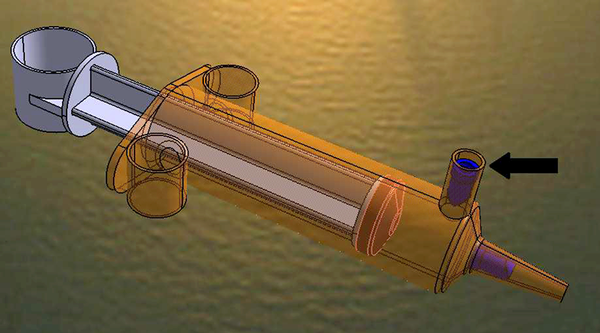 As shown in Figure 1, the device consists of a 60-mL gavage syringe, which is the main part of the device, 2 pieces of one-sided valves to conduct the fluid in only one direction by pulling or pushing pressure, and 3 pieces of rings for comfortable fingers positioning and possible one-handed application. The described device connects to a serum container through a newly designed plastic hose and a spiky connector, which supply an appropriate flow for the washing fluid. Handmade syringes were sterilized using plasma sterilization method. Thus Safe Irrigator Syringe is a polymer based device, sterilization in relatively low temperatures (≤ 50°C) was necessary to preserve integrity of the device (9). By pulling the piston back, the fluid is conducted through the one-sided valve (the arrow) from the serum container to the syringe. At the same time, the other one-sided valve positioning at the tip of the syringe obstructs the entrance of air into the syringe. Conversely, as the piston is pushing forward, the first one-sided valve (the arrowed one) blocks the fluid to flow back through the plastic hose while the fluid flows through the one-sided valve at the tip of the syringe and provide adequate pressurized wound irrigation. Also, in our method, liquid column pressure facilitates delivering the fluid from the container to the syringe and limits hands disturbance and discomfort. This occurs because the normal saline container is hanged at least one meter above the syringe level. Study population consisted of 10 medical interns (6 females and 4 males) selected from students of Tehran University of Medical Sciences. After wound irrigation using the designed device, all participants stated that Safe Irrigator Syringe is quite applicable in wound washing. All of them said that one-handed usage of the device as well as maintaining sterile condition was possible during wound washing. Nine participants believed that the new method is superior to the conventional method; as the new method was more effective and less difficult. Only one of the participants believed that there was no considerable difference between the new and other methods regarding the efficacy and difficulty of the procedure. We appreciate our mentors, Prof. Mehrnaz Rasoulinejad and Prof. Mohammad Pajouhi for their kind supervision and consultations. Authors’ Contributions: Study concept and design: Behnam Heidari and Atieh Pajouhi. Data collection: Behnam Heidari. Drafting the manuscript: Atieh Pajouhi.